helping your child gain independence and unlocking their true potential. We provide early intervention services to children who are blind or visually impaired, helping your child gain independence and unlocking their true potential. Or give us a call at (888) 636-8477. A tactile, multi-sensory art exhibition. Our services help parents and caregivers navigate the unknown. How can VIPS help your child? We empower a young child with blindness or low vision to navigate their world and gain independence. Why is early intervention so critically important? 85% of the foundation of learning happens the first 5 years of their life. How does your donation benefit a child who is blind or visually impaired? Provides a child with a magnification device. Provides a child orientation and mobility instruction. 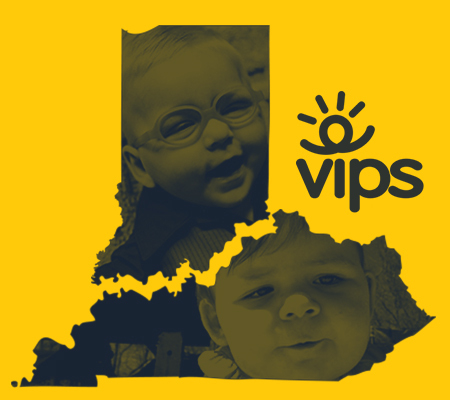 Your donation directly impacts the life of children who are blind or visually impaired in Kentucky and Indiana.